This is no Easter bunny but the famous Lord Rabbit. It is a toy for the Mid Autumn (full moon) festival in the Beijing area. 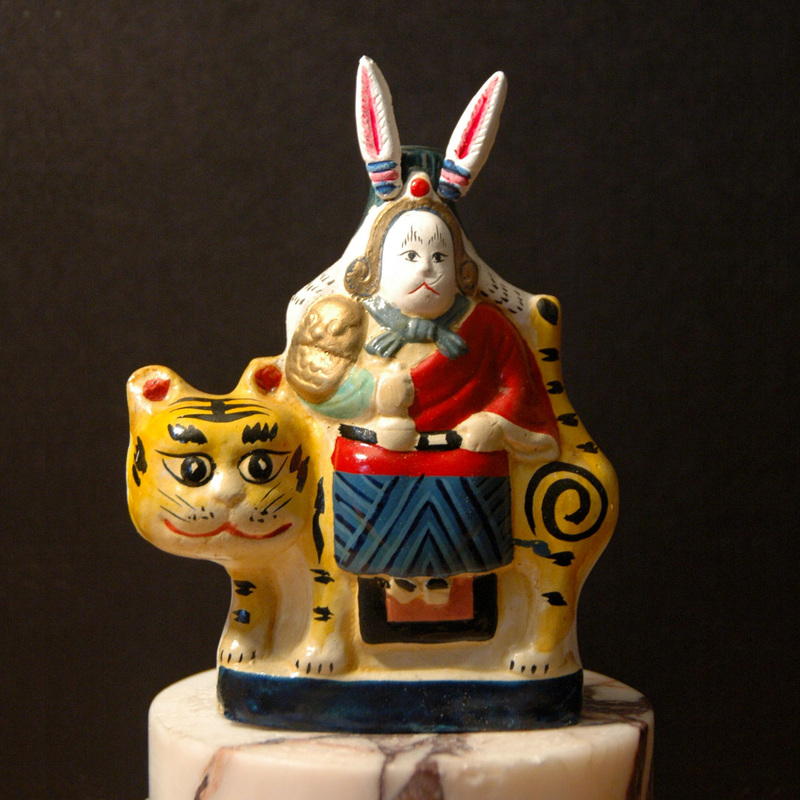 The Lord Rabbit figurine first appeared in the late Ming dynasty, it was mainly used for worshipping by the younger generations. It is believed that Chang E, the moon goddess, has a pet rabbit who is whiter than white jade as he was named as the Jade Rabbit. The Jade Rabbit was specialised in preparing the medicine (you might have seen images of him stirring the medicinal pot on the moon). Jade Rabbit worshipping has then been taken into moon worship and since rabbit has been kept as a household pet, out of respect for the Jade Rabbit god he was worshipped as the Lord Rabbit. By Qing dynasty Lord Rabbit has turned into a toy for the Mid Autumn festival. The folk story goes; once Beijing was infected by plague, almost all the household got sick, the moon goddess was sadden by the news and sent the Jade Rabbit to help cure the capital. At each household he healed he would turned down any gifts but instead borrow a new set of clothing. With the new clothing he would assume a different image for the next household, sometimes a female, sometimes a general etc. He would also take on different animals for transportation; a deer, a tiger, a horse etc., hence there are many different versions of his figurines. A beautiful story for Easter Sunday!